Successful community service Food for Thought will open its second store in Dundee. A community food service in Dundee has proved such a success it will be expanding into another part of the city. Food for Thought operates out of Charleston Community Centre offering groceries for a small fee. Service users pay £1.50 to be members and are entitled to a bag of groceries which would cost much more in shops. More than 100 people are members, with around 60 of those using the service in Charleston every week. 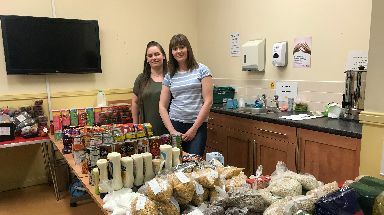 The not-for-profit organisation has proved such a success it will now be opening a community store in the Lochee area of the city this June. Samantha Bruce, a Food for Thought volunteer, said: "It's not quite a food bank, the way I describe it is a food bank alternative. We don't rely on donations, it is completely self sustaining, the members pay for their own things. "We are going to be opening up in Lochee. We are hoping to be open three days a week. It will be called Lochee Community Larder and it will work along the same process. "It will have a £2 membership fee purely because we will have more overheads. Hopefully it will be more of a shop experience with a better set out, but the members will still be able to choose what they would like from what's available." Samantha Roberts, one of the trustees of the new store, thinks the success in Charleston is partly down to the fact members feel they are making a contribution to help themselves and others by paying for the food. She said: "Having to pay the £1.50 helps everybody. "It helps us buy the food for them, but it also makes them feel, 'well do you know what, I've paid for this, I've done this myself. I've not had a handout, I'm not relying on charity, I've done it myself' and that's a big part of what we are trying to do here." Despite the service's success, Ms Roberts said she hopes to see a day when it is no longer required. "We want them to have everything they need, but at the same time we are here if they need us."